Purchase your Bug Out Weep Hole Insect Barriers today! To determine how many Bug Out Weep Hole Insect Barriers you need, walk around the perimeter of your home counting each individual weep hole making sure you count the weep holes behind shrubbery. 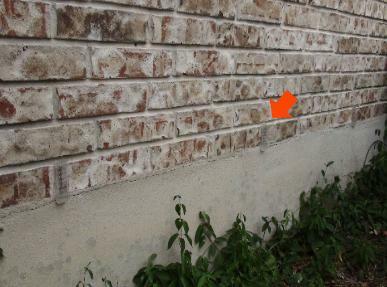 On newer homes weep holes may be above the garage, above the front door, and above your windows on 2 story homes. The amount you need varies on the square footage of the home or business. A small home may have 25 weep holes while a larger home may have 175 or more. Make sure to place a Bug Out on each weep hole to make this barrier effective. If you are a business, builder, or want to become a distributor or installer, and need a large quantity please email us in our Contact Us section on the bottom of our home page. The product is discounted as more units are purchased. Now made of clear polycarbonate plastic that blends against any color stone or brick background.